10 WHAT IS THE STAMPIN SCOOP SHOW? Have you heard the news? 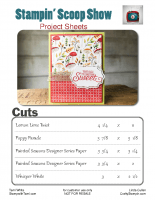 Stampin’ Up has more new Sale-a-bration products coming in February and March! New framelit dies that match existing Sale-a-bration stamp sets will be available for purchase. Including dies to match the frogs and lilies….wahoooo! In addition, 3 new Sale-a-bration products will be available free with qualifying orders (in addition to the exisiting products). We’ll share all of this and more on this episode of the Stampin’ Scoop Show video. What is the Stampin’ Scoop Show? Win new products: We’ll be giving away some of this new product (not yet available to customers). See the giveaway. UPDATE ON RIBBON: I mentioned on the video that the sold out ribbon will not be coming back. After the video I reread the post from Stampin Up on this situation and it appears that is not entirely true. There’s a chance it may come back if there’s any left after the back orders, while it lasts. No promises, but here’s hoping. Here are the chapters of this online class video in case you’d like to skip ahead to certain portions. JOIN STAMPIN UP: Choose $175 worth of products and pay only $99. That’s $76 FREE! Get the Craft & Carry Tote for $30 more (demo exclusive). Get free shipping on the kit. You can purchase this just for the discount. It’s the BEST DEAL!!!!! Here’s the card we made today, and a free pdf for you. Below are all of the card ideas we shared today for you to enjoy. The “After Live” Drawing requires a comment on the video to enter. In order to enter, please leave a comment on the Stampin Scoop Episode 73 video on either YouTube or Facebook If you share the video on Facebook (and type “Shared”) you will receive a 2nd entry. Looking forward to see the new Sale a Bration items. Great Video on the new items. Can’t wait to b able to order these! Fun!! Love your show and all the info. Looking forward to ordering these new Sale-A-Bration items! Looking forward to March 1st. I feel there will be new things coming my way. Loved seeing the new items. Love your card ideas Tami! HI!!! I love your videos and your ideas. I love the painted season set and paper. I always look forward to watching.